Our 1.44 inches display screen BF18 Bluetooth FM transmitter is a very special one that can show the music active on your trip. Just enjoy our FM transmitter with your Journey. 1. 3 USB Ports: One for USB music file playing; two designed for charging (iOS and Android devices). 2. Private Calling: You can Long press call answer button for three seconds to answer the call privately, instead of via Bluetooth. 3. 3 Playing Modes:You can long press the mufti-function button to switch the playing modes (single/normal/shuffle) while playing songs from USB flash driver or TF card. 4. Power Off Automatically: The Bluetooth FM transmitter will power off automatically without any operation in 5 minutes (without flash drive or TF card in), you need to long press the mufti-function button for 2 seconds to turn it on again. 1. For the best audio quality, find a least interfered frequency, and adjust to find an ideal volume for the Bluetooth FM transmitter (Volume 15 is usually good). 2.To achieve great quality sound, please try other vacancy FM frequency or use the Aux In port. 1. 3 USB Ports: Bluetooth FM transmitter has three USB ports, one for USB music file playing; two designed for charging(both iOS and Android devices). 2. Stylish Design: FM transmitter with Large LED display screen showed the music active, and supports AUX input, also support full frequency point to launch, range from 88.1Mhz to 107.9Mhz. 3. Widely Compatibility: Work with iPhone (max speed), iPad (max speed), iPod, HTC, Galaxy, MP3 Players, PDAs, Mobile Phones. 4. 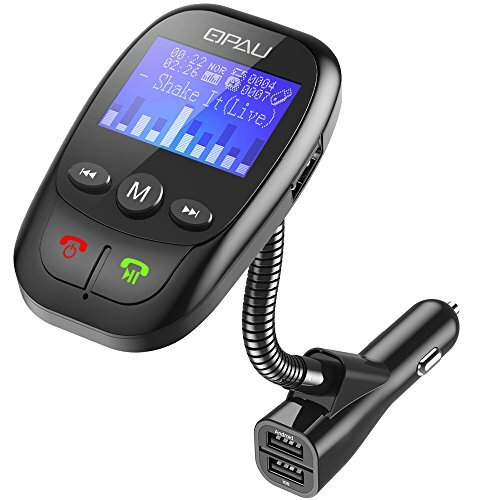 Better Sound Quality: Bulit-in Microphone, support hands-free phone calling; supports TF / Micro SD Card in FAT format up to 32G memory; supports MP3/WMA format songs only,support in-car stereo steaming; supports A2DP; support AUX Input. 5. Power off Automatically: The Bluetooth FM transmitter will power off automatically without any operation in 5 minutes (without flash drive or TF card in), you need to long press the Hang Up button for 2 seconds to turn it on again. If you have any questions about this product by QPAU, contact us by completing and submitting the form below. If you are looking for a specif part number, please include it with your message.